Both versions are the same basic walk. Route 1 avoids the short steep valley section in Route 2 (which has good views of the Downs). 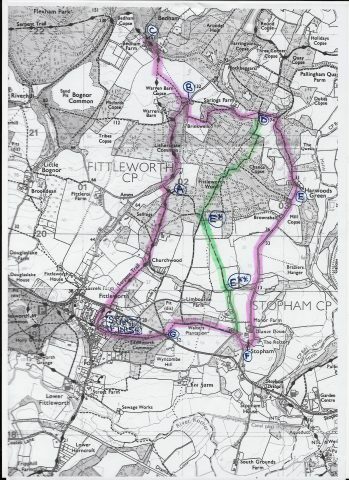 The walks were written for our village Elgar Centenary Weekend (2nd-4th June 2017) and the concept of the walk was based on a sketch map drawn by Elgar for his friend violinist Billy Reid to get to Brinkwells. Both versions of the walk pass Brinkwells, the Bedham cottage that Elgar rented from 1917 to 1921 and where he lived with his wife Alice and daughter. The walk leads to Wakestone Lane where the now derelict Bedham school can be found. The building is privately owned and care should be taken; a sign warns of Danger!. The school was used as a chapel on Sundays; Elgar’s wife heard the bells of the chapel ringing out peace at the end of WWI. After leaving the old school a short detour can be made to find Elgar’s Studio; continue a short way down the lane past the Post Box at Point C and the Studio will be found on the left, where it has been re-located. The original part of the studio was in the garden at Brinkwells and this is where Elgar composed his ‘cello concerto and much chamber music including the violin sonata Op. 82, the string quartet Op.83, the piano quintet Op. 84. It was also used by artist Vicat Cole. Return to the Post Box at point C to continue the walk to Brinkwells. This is followed by Springs Farm where farmer Thomas Aylwin provided pony and trap transport for the Elgars and their visitors from Fittleworth and Pulborough stations. The walk continues to Stopham through the Stopham Estate and then back to Fittleworth. We hope you enjoy the walk, written by Chris Welfare. We cannot be held responsible for any damage or injury to any party as a result of its use.